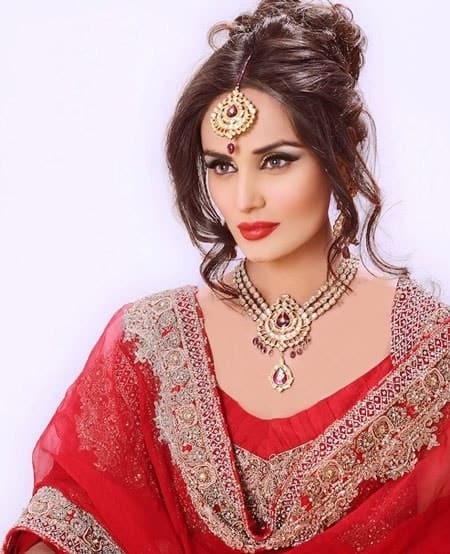 The alluring elegance of the Lehenga makes it one of the most lavish ensembles across India. Still, even this rich, flowing designer skirt loses its splendor without a gorgeous, complimentary hairstyle. 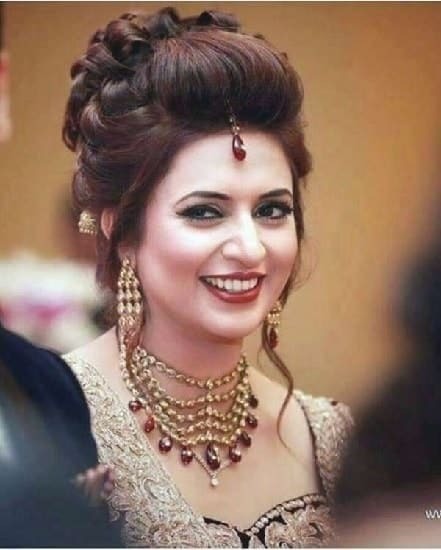 We have put together 40 stunning hairstyles for lehenga for different hair lengths, face shapes and occasions. The hair is loosely brushed back, and to the side, using a wide tooth comb or your fingers. 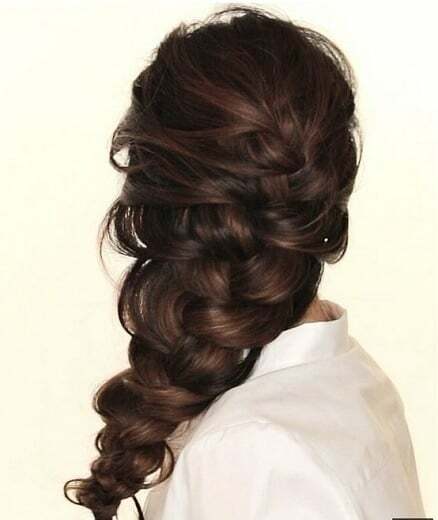 A thick, voluminous, messy plait is made from the preferred side, to rest in an elegant coiffured style. A tendril or two may be left to wisp around the face. This simple, classy look, is made possible with brushing the hair loosely back, and fastening an accessory to join the two main hair pieces. A messy plait is then made from the nape, to taper till the end. This elegant style for lehenga is done by parting the hair to the side, whilst the other side is dazzled with an accessory. The rest of the hair is left to flow loosely to one side. A heating appliance may be used to create gentle animated waves. 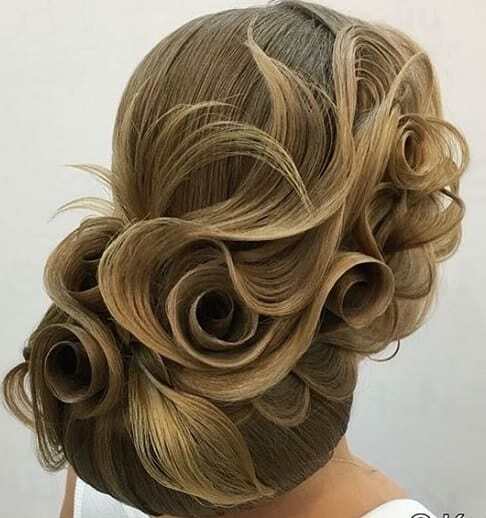 The hair is brushed back in a slight puff, and secured with pins. Hair is parted at the temples on both sides, and twisted till they meet at the back. The same is done from the cheekbones. A beautiful accessory is clipped onto the back. A curling iron is used to create long flowing spirals for a superb style. This playful, feminine style is simple and voluminous. The hair is brushed back with fingers, and secured in a ruffled way with pins. The rest of the hair is left, to cascade in flowing layers and waves. A tendril or two strays along the cheekbones. The hair is sprayed with a high volume mist and brushed back to create a lift. Fly away strands are secured with matching accessories. A scarf may be worn at the nape of the neck to create a flow. Part asymmetrically up to the front cover. Secure with a gorgeous accessory on one side. The rest of the hair is styled with big bouncy curls, to create a vintage, 60’s look which will go well with your lehenga. One side of the hair is brushed back, secured with an accessory; and curled into a large bang. The fringe is given volume, and blow-waved in a front billow. The rest of the hair is clouded around the face. A large bang is made to extend from the side along the jawline. 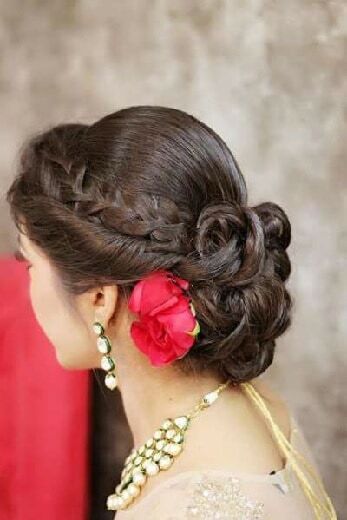 Use a high volume spray to create depth for this hairstyle with lehenga. Pull back the hair between the temples using your fingers, and secure with pins. Brush either side of the hair to meet at the back of the head and use a dazzling accessory to secure all loose ends. The front of the hair is parted to one side, brushed in a slant, and fastened with pins. The rest of the hair is curled to create volume. 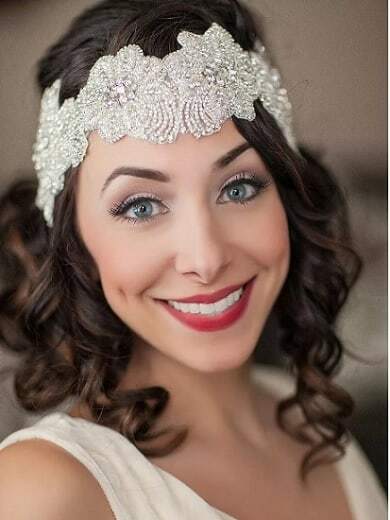 A gorgeous headband rests on the circumference of the head. Sides of the hair under the band is gently pulled forward, to shape the face. The hair is parted in the middle and neatly brushed back. A simple coiled bun is made and volumized with faux hair. 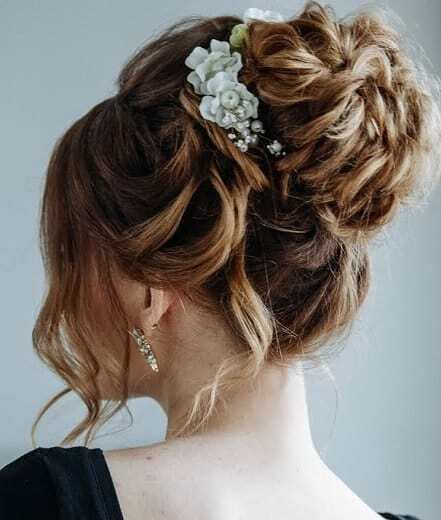 A circlet of matching flowers is arrayed over the bun, giving it a beautifully chic look. 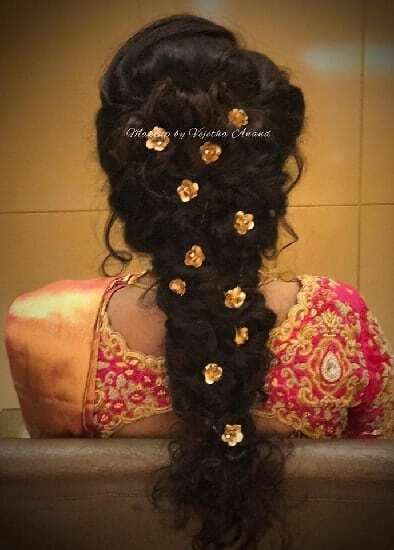 In this hairstyle with lehenga three rows of hair are weaved, and intertwined in parallel rows towards each cheekbone, and secured with pins. 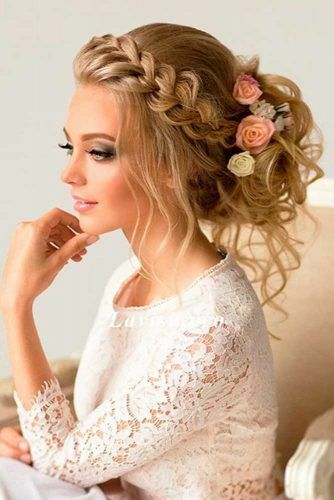 The remaining hair is puffed high on top of the head, and fastened with a large faux bun of your choice. Accessories enhance the dazzle to the ensemble. For a playful but classy look; part hair asymmetrically to allow free tendrils. A thin plait is made at the right earlobe and draped across the head towards the back. 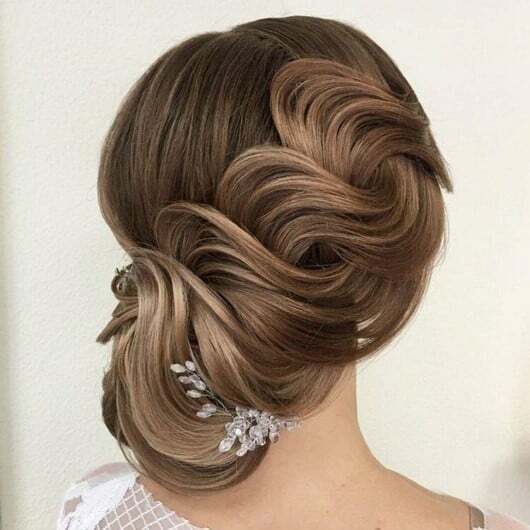 The rest of the hair is puffed high and whirled into a messy bun above the nape. The plait garlands the bun. 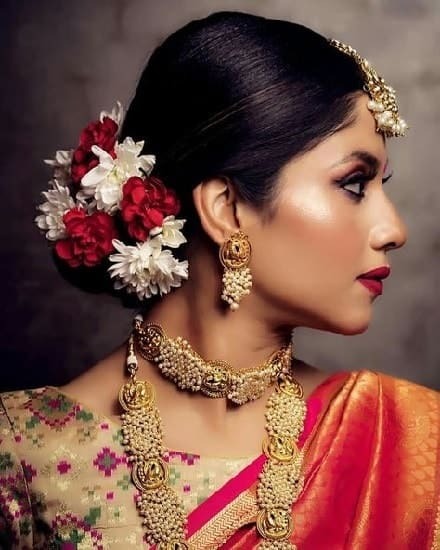 This chic bun brims elegance and is so simple to style with your lehenga. The hair is brushed back neatly and evenly, to form a classy coiled bun, at the nape of the neck. Fasten with pins and an accessory of your choice. A stunner for layered hair. The hair is loosely pulled back with fingers, and puffed at a high angle to the cheekbones. The bun is a messy one. Faux hair is added to create volume. Wisps of hair is left to veil the sides of the face. 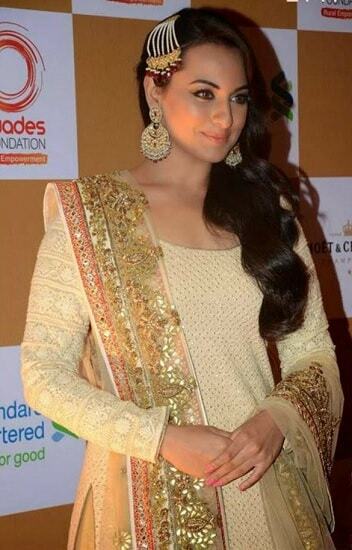 If you have the gentle features of Sonakshi Sinha, then you have a round face. The secret is to wear a style that makes your face look slender and long. The layers of hair are loosely curled to create large, long waves, that free flow along your face, to add length. Part your hair in the center to allow both sides of layers to free flow. Part enough hair in the middle to flow to the chin. Pull the rest of the hair back, high on the head, and secure. Clip down faux hair for a giant chignon. A clip on braid is added as a head band. The asymmetrical look always creates length to a fuller face. Part the hair and allow to cascade around the face and back. Using a heating iron, create long billowing waves. 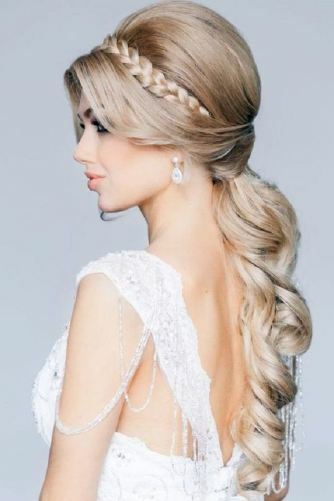 Complete the style with a hair colored plaited braid, just like a Princess. 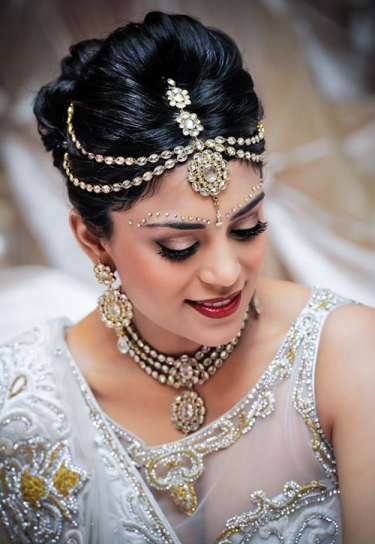 This timeless hairstyle for lehenga is characterized by its free-flowing layers and a messy updo. Side part the hair and allow the shorter layers to flow along the face. 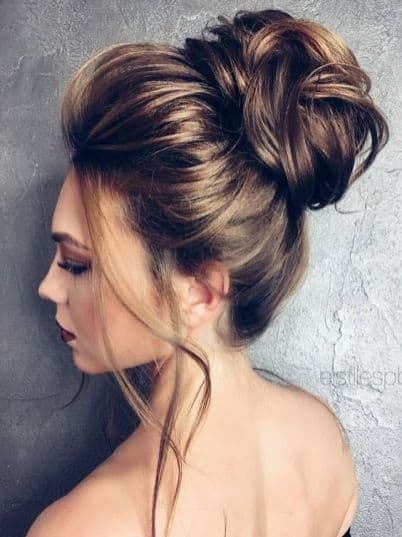 The rest of the hair is swept in a slant towards the back in a messy pinned bun. This style is easy and requires an asymmetrical parting. The rest of the hair has gentle swayed waves which can be brought forward around the face. 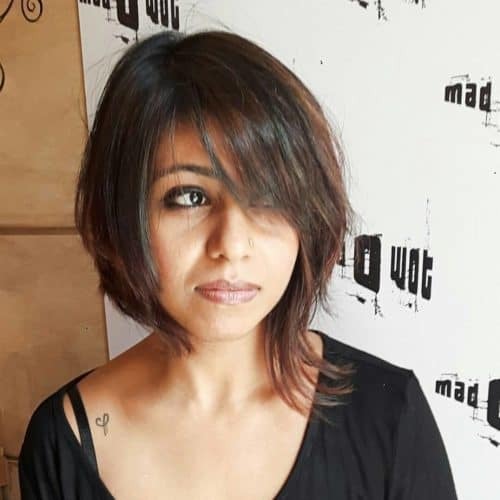 If your face is pretty balanced and as close to symmetrical as Karishma Kapoor, or Anushka Sharma; then you have been blessed with one of the only faces that can pull off just about any hairstyle. All of the hair is interlaced loosely to one side of the head and face in a large French plait. The braid is pulled and teased to create volume. Fasten the bottom of the braid with a clip, and add an accessory for a striking look. 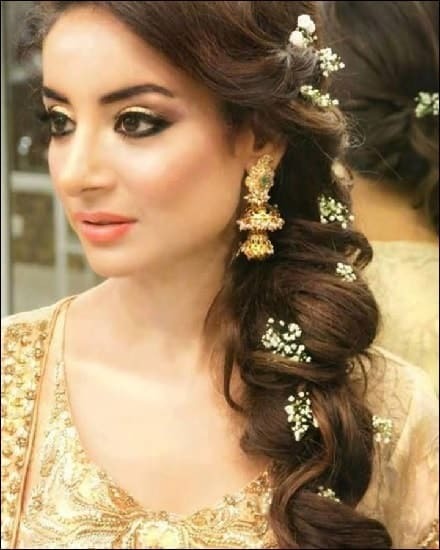 The side swept layered chignon is an elegant style that is versatile with the Lehenga. The hair is side parted, wisps are left to free flow, clouding the face. The rest of the hair is pulled back, a slight puff on the top gives way to a large messy updo. Sultry and beautiful. The hair is center parted allowing the shorter layers to wisp over the ears. The rest of the hair is puffed up and firmly secured at the nape. The length of the hair is interlaced and rolled forming one, long, flowing ponytail. For a youthful style, plait one side of your hair just above your forehead. The rest of the hair is brushed back, and fastened with pins, to form a messy updo. Loose layers are left to hang free from the bun, and at the side of the face. Accessorise as you prefer. The hair is pulled back with your fingers, and secured high, with a dazzling banana slide. The rest of the hair is curled and left loose. 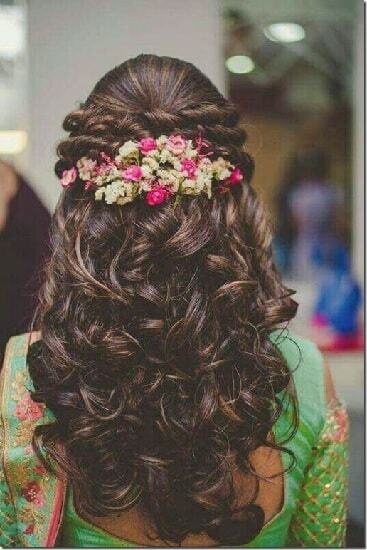 If you have natural locks, this is the perfect flowing hairstyle for your lehenga. 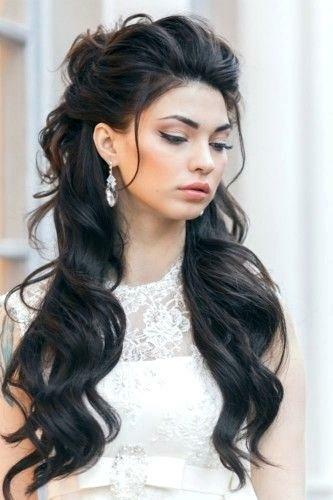 This gorgeous style is perfect for layered hair. Gently hot iron long waves on loose hair. Skim your fingers from both temples to form a tousled fusion at the back. Fasten with pins. Allow the rest of the hair to flow free. Enhance with accessories. For a full, natural look; hot iron the layers to extend outwards. Part the hair deeply on one side, and style back, and across. Use volume mist to puff up the layers for added dimension. Chignon panache is made simple with this style. Bouffant your hair with your fingers. Form a high bun that is loose and interlaced. Leave a few long wisps to flow freely. No added faux for this youthful style. French plait from one earlobe to the other. Brush back the rest of the hair and French plait to the nape, pulling in the side braid as well. Secure with a band, and allow the rest of your hair to spiral down. Hair is parted between top and bottom. The top is backcombed in a bouffant and rolled inwards to form a row. Secure with pins, and repeat the process with the lower hair. For a mysterious and classy look, part your hair in the middle, and flat iron till the nape. 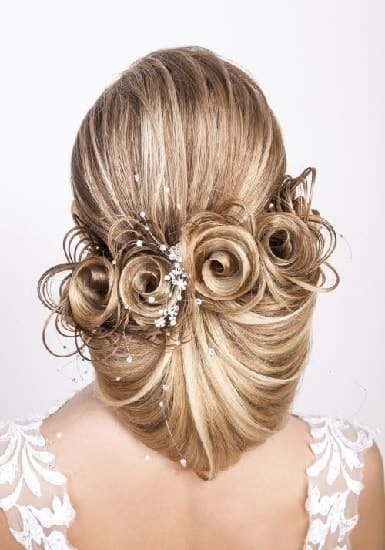 The rest of the hair is curled to form sophisticated clustered tendrils, which you can wear to one side. A simple but chic style if you have long, curly hair. Part your hair in the middle. Create a semi firm braid to one side. Tease the braid to loosen it, and form a bulky curly plait. 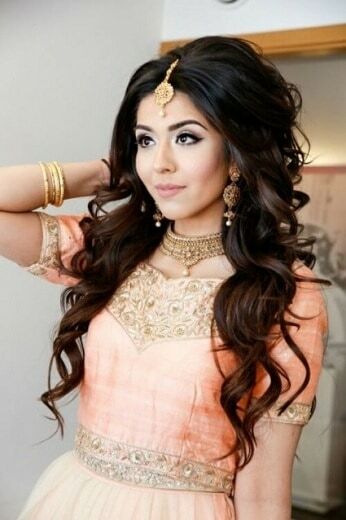 A stunning hairstyle with lehenga for any face shape. Skim your fingers through your hair and form a high, full bun at the back. Allow loose wisps to hang freely. Faux hair may be used to create volume. Secure with pins. French plait your hair, and puff up the mid-top section to create volume. 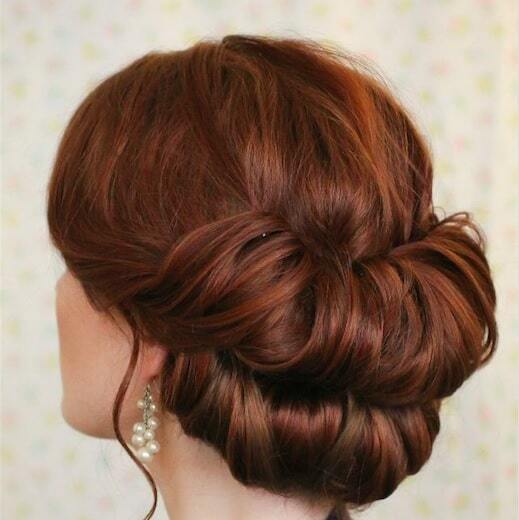 Make an elegant round bun with your braid, and secure with pins for a Victorian look. Faux hair may be added. The hair is backcombed at each eyebrow arch. A puff is formed and secured. The rest of the hair is styled straight till the jawline and then curled into long spirals, to create a classy urbane look. The hair is brushed firmly back to the nape, and secured with a giant faux bun. 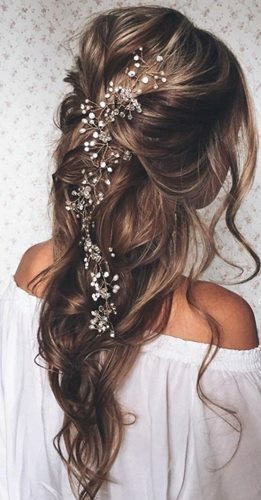 An exaggerated faux hair accessory matching your hair color is pinned from the bun to the side of the head. 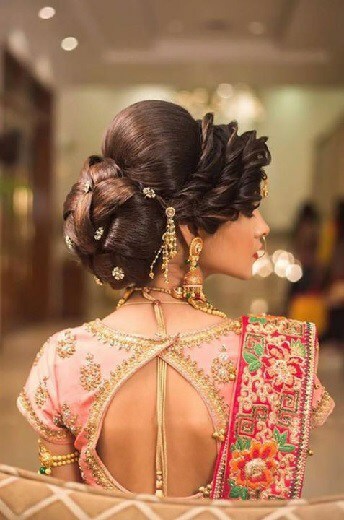 Extremely stylish hairstyles for Indian women with the Lehenga. For a delicate look; loosely brush the hair to one side. Fasten at the ear. French plait the rest of the length using smaller pieces. Tease the braid to create volume. The hair is loosely brushed back, and fastened at the nape. Fold hair in, to form a long, wide chignon that touches the middle of the upper back. Adorn a gorgeous faux accessory to show off an elegant style. For a young at heart style, extend a French plait from one side of the front to the back. Leave a row of loosely rolled hair beneath it. Puff the rest of the hair back, and interlace, forming a low bun; which can be adorned with an accessory. Indeed a stylish bun to complete the glamour of your Lehenga. Side comb the front of your hair, and form a braid that is loose enough to be pulled, and teased. 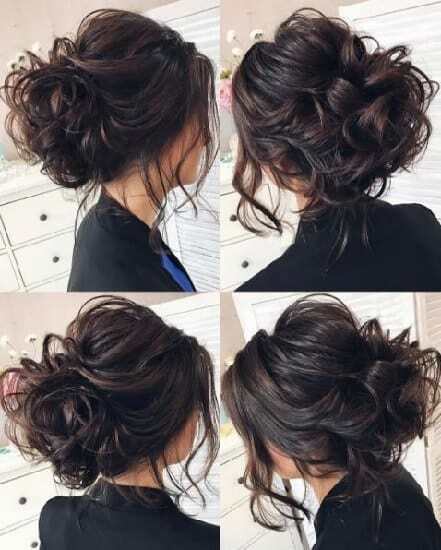 The rest of the hair is brushed in a puff, to join the braid, which flows all the way back to form a low wavy bun. 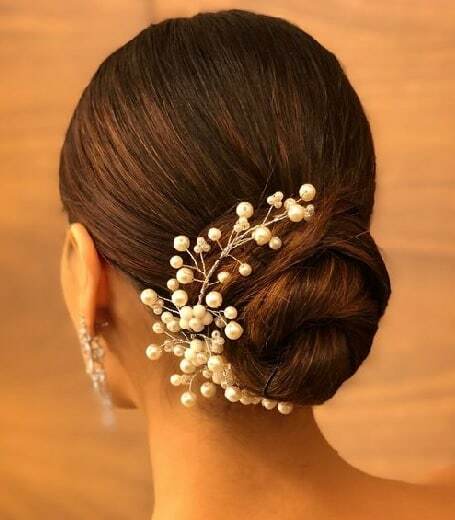 So, whether held back in a classic chignon or left to loosely accentuate your ensemble; you would need to carefully choose a hairstyle that compliments the cascading elegance of the Lehenga, and invest in your hair, after all, it is a crown you will never take off.